When competing in sports, the only thing that should matter is your ability to play the game: to step up and deliver when it counts. As athletes, we devote our lives to perfecting our craft. We chase dreams, we sacrifice, and often, we find solace and comfort in our sport. For many, our training, our teams and the field of play is a sanctuary. It’s not a sanctuary we take for granted. The efforts of activists before us have provided us both with the opportunity to live authentic lives in the open and realize our personal and athletic potential through sport. As beneficiaries of such brave efforts, we do not take our responsibility as activists lightly. We believe it is our moral duty to use the platform we have been given to speak out. That is why we are voicing our opposition to the anti-transgender bill SB3 in the Texas legislature. SB3 would make it impossible for cities and school districts to proactively protect LGBTQ people in restrooms, locker rooms and other changing facilities. As written, it would also take away existing protections that millions of LGBTQ Texans have in cities such as Austin, Dallas, Fort Worth and San Antonio. This legislation would also pose more obstacles for transgender athletes. If this bill passes, trans people could be forced to use a locker room that is inconsistent with their gender identity. In turn, Texas would be subjecting trans athletes to harassment, bullying and possible assault. While we do not identify as transgender, we know what it feels like to be singled out for not fitting neatly into social norms. We have often been subjected to scrutiny and harassment for our gender expression. We play basketball, a sport that encourages women to be strong and competitive and challenges the cultural expectation of what it means to be woman in athletics. Because of our gender expression, we often struggle with navigating public spaces such as restrooms, restaurants and airport security, spaces where we have been called “sir” and “mister.” We empathize but cannot understand fully what it means to walk in the shoes of trans folks. As difficult as it is for us, we can only imagine how hard it must be for a transgender person. Lawmakers who support this legislation say that it is to “protect women,” but who said we needed protection? As athletes, we are not worried about the imagined “threat” of a transgender person in our spaces –- we are worried about being accountable teammates, good people and competing at a high level every single day. We reject any attempt to use our names to push this bill. We know that our lives are enriched by the diversity that exists in sport, and we know that when we give people the freedom to be themselves unapologetically, everyone wins. The NBA has noted that this type of legislation can lead to hostile environments –- both for players and for fans of basketball. Earlier this year, the NBA released a statement in response to a question about a previous, similar bill, SB6, which was introduced during Texas’ regular legislative session. In February, an NBA spokesperson said “we consider a wide range of factors when making decisions about host locations for league-wide events like the All-Star Game –- foremost among them is ensuring the environment where those who participate and attend are treated fairly and equally.” Rightfully, this was interpreted as a condemnation of bills that would treat transgender Texans unfairly. Additionally, the Women’s Sports Foundation (WSF) recently teamed up with the Human Rights Campaign and TransAthlete to co-sign a letter opposing bills such as SB3. As athletes with ties to Texas and an interest in equality and fairness, we wholeheartedly agree with the WSF and the NBA’s assessment that an anti-transgender law would harm players and fans. Texas is risking the safety and well-being of its transgender residents with this harmful legislation. Furthermore, as we saw in North Carolina, discrimination could cause the state to lose out on future opportunities for big-ticket events, which harms every person and every business in the state. As athletes this bill falsely claims to protect, we want to state clearly: We believe trans people should unequivocally have the same rights as we do. Maybe you have read this because you have a connection to one of us. Maybe you know us as a fan. Maybe this is our first introduction. Society has made major strides in recent decades to accept others for their differences: whether it be opinions on gender, mixed race couples, or LGBTQ relationships, we’ve both seen how accepting others for their differences can improve lives for the better. Today, we’re confronted with a similar call: to stand up for our trans brothers and sisters in the face of discrimination. So whether you know a trans person or not, we ask that you join us in the fight to protect the equal rights of all people. Equality is a team sport. Together, let’s stand on the right side of history. Please contact your legislators and make your voice heard. Change only happens when we create it together. 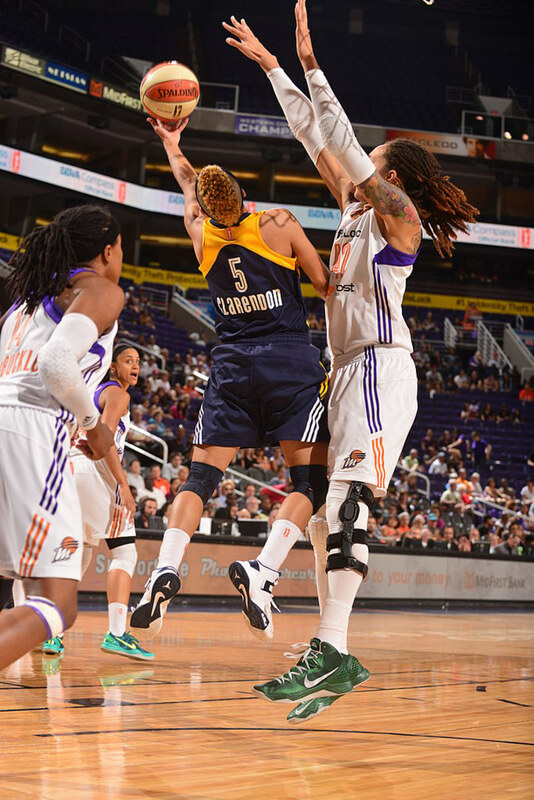 Brittney Griner and Layshia Clarendon play for the WNBA. Griner formerly played basketball at Baylor University.